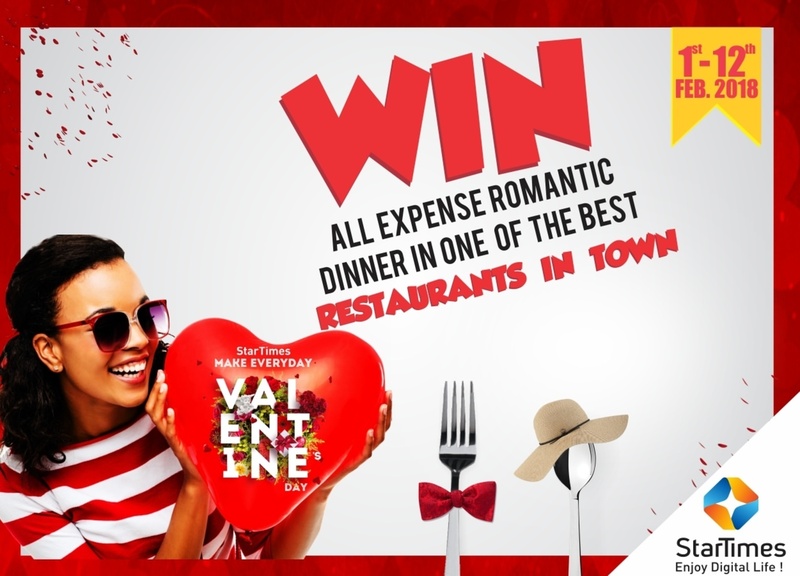 Win an all expense paid ''Romantic Dinner'' in one of the best restaurants in town with your lover this month of Love. Valentine’s Day is a special day to express Love and Affection to your loved ones. 3. Send entries via mail to dm@startimes.com.ng with your Name, Facebook ID, Smart card number & Address. Entries that meet required criteria will be selected & posted on our Facebook page. Check out for your PICTURE/VIDEO, if selected. Share the link and ask your friends & family to Like & Share to stand a chance of being selected. 5 creative PICTURES/VIDEOS with the highest number of likes and shares win. Entries ends 12th February, 2018.